The journey of discovery for your senses. 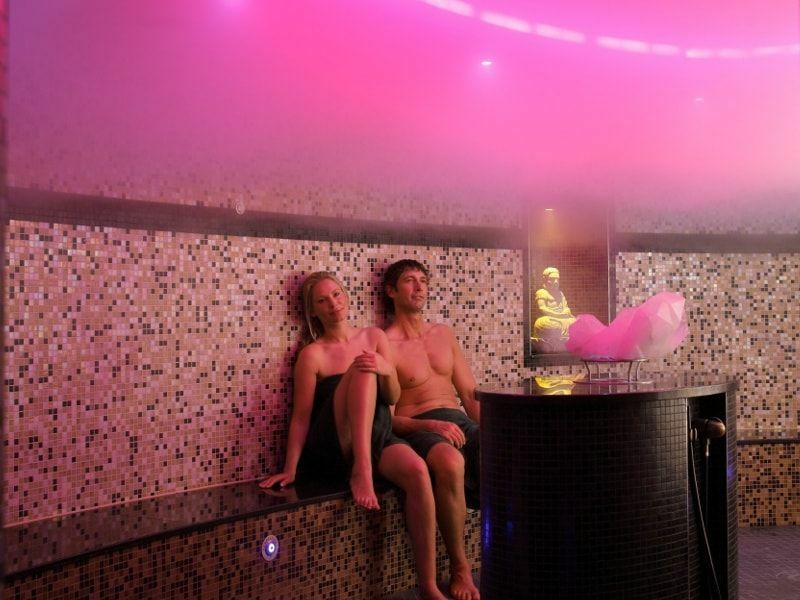 The modern Scandinavian sauna landscape of H2O Herford offers stimulation for all the senses. 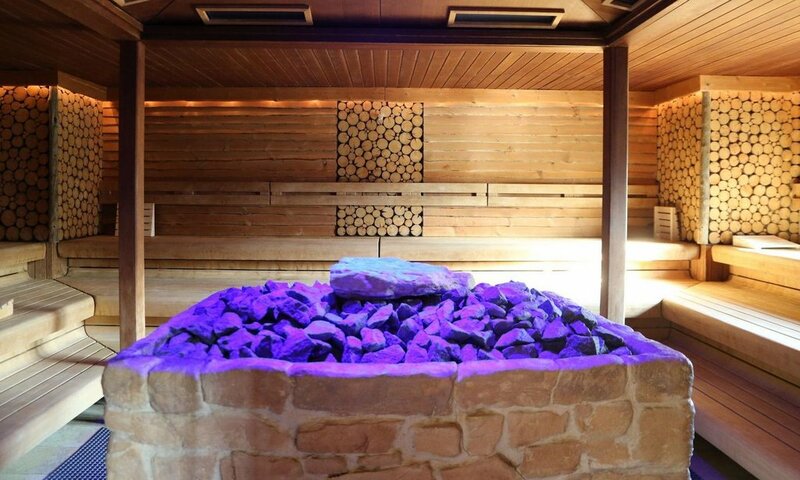 With light, colours, scents and sounds we have created a place to relax and enjoy life at a slower pace, much different from the classic sauna facilities. Please have a look at our Sauna World. A showroom with spectacular infusions and events. The Vaikutus with its built-in gneisses and barrel roof is not only visually appealing. High-quality lighting and sound technology also has a lot to offer and provides special effects with music, plays of light, ground fog, lasers and black light. Due to exercise and preparation phases, it can happen that this is temporarily closed for a short time. Discover a fascinating journey at the Vesitorni tower. Inside there is a 320° panorama with films of the dream beaches of the Algarve, the Yosemite National Park and other great sceneries! You are sitting in a relaxing way, your feet are swinging in the water and a water play is inspiring you. We invite you to linger with a self-designed water and light play. 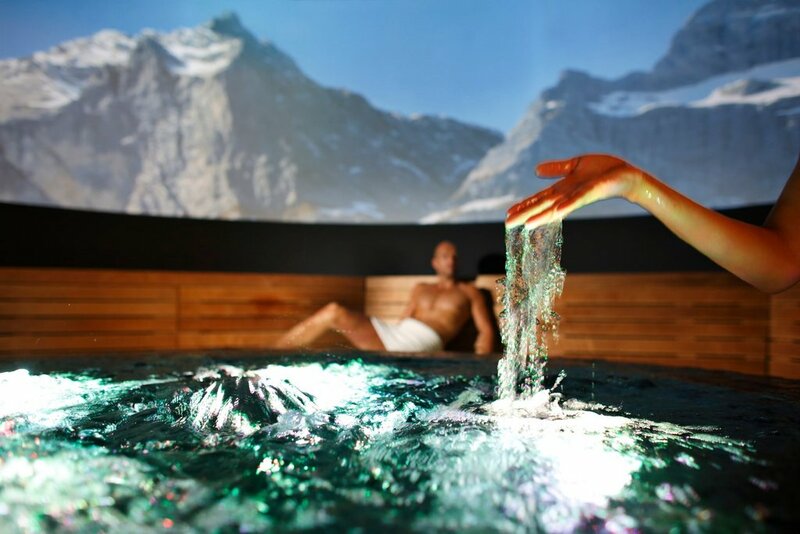 Experience the elements: Fire, water, earth and air as well as a composition of different fragrances, warmth and light in a unique concept sauna. You pass through the various elements water at 75°C, earth at 80°C, air at 85°C and finish the various infusions with the element fire at 90°C. Let us take you to an infusion of different fragrance experiences and look at the reaction of the water. Meditative music - a mixture of different colour accents and sound bowls round off the feeling of relaxation. With the scent of oranges and coloured light show. Changing colours and fruit scents. Salt sauna with brine plant. Soft, relaxing music and the fresh scent of lemons. Healthy sauna infusion with the scent of hay. 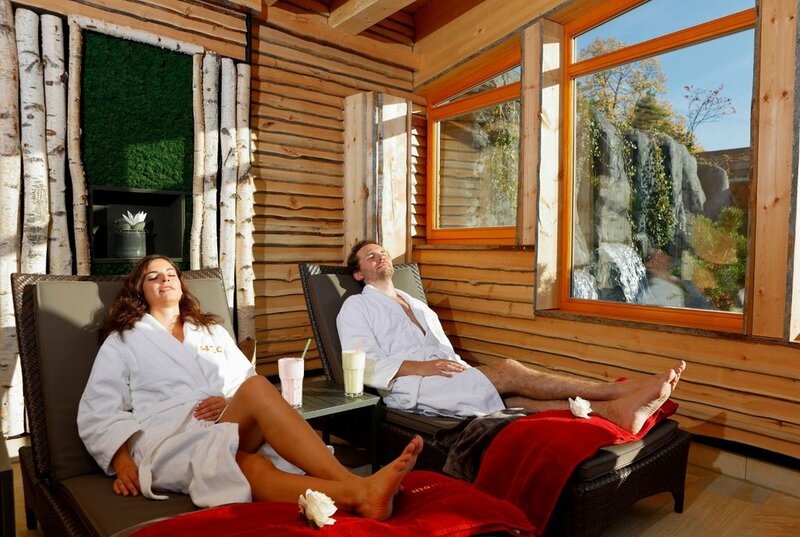 Large sauna infusion with view of the sauna garden. Sauna infusion with splendid panoramic view. Relax, let your mind float free, be at peace, simply feel good. That’s what awaits you at the H2O Saunawelt, with its unique ambience. 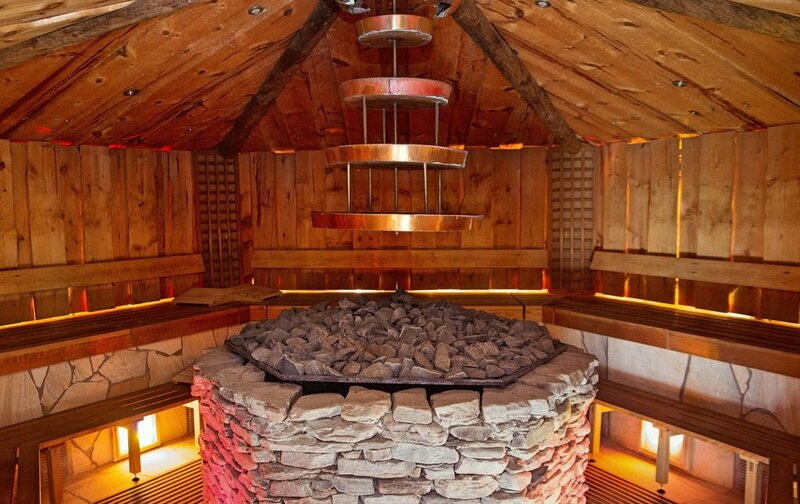 The Nordic sauna garden with its Mediterranean touches takes you into another world. Enjoy the sensation of relaxing by the lake, or just chilling out in one of the many seating possibilities. Seated round the stove in the cosy cabin you can let your gaze roam over the sauna garden with the river running through it and forget about the stresses of everyday life. Lying on the tiles of the marvellously anatomically shaped heated recliner it’s easy to forget about place and time. You will feel the lightness of your body and the gentle warmth. You will hear birds chirping and the soft tinkle of spheres. The colours of the sky and the garden pour into the room through the big windows. The big Finnish relaxation room welcomes you beneath palm trees, a Lapland chandelier made from real reindeer antlers and a wide sky to greet you through the big roof windows. Hand-cut, hand-joined Kelo wood beams support the attractive roof structure, which is randomly lit up by the changing coloured light. The gentle splashing and soft gleam of the water wall puts you soothingly in touch with the elements. Chunky round grey beams cut from Finnish Kelo tree trunks and massive, warm-grained planks with rustic knots characterise the cosy relaxation room. 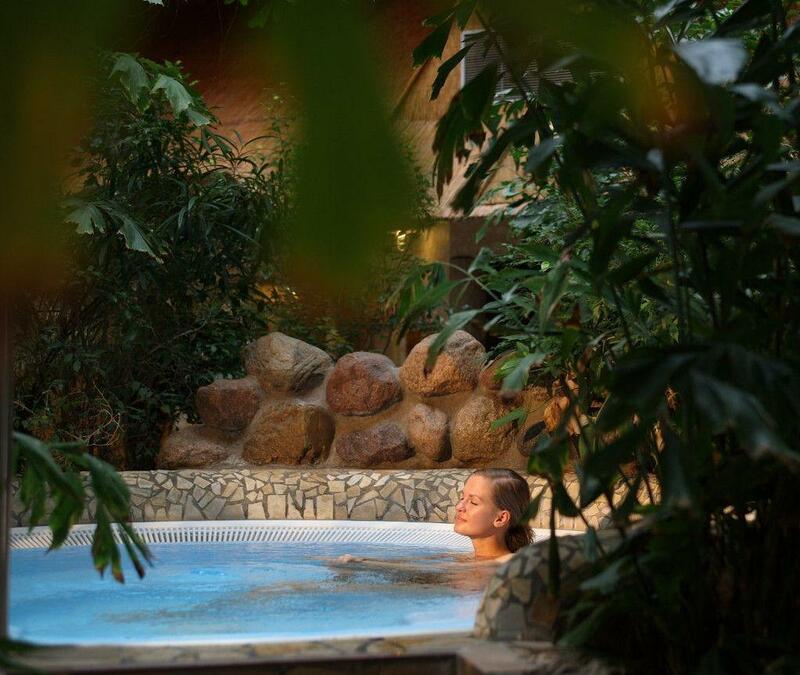 Simply switch off and let your muscles relax in the large outdoor pool, which is maintained at a pleasant temperature, or in one of the whirlpools in the sauna garden and indoors. Enjoy warmth and the feeling of security. Relax from the stress of everyday life in our quiet zones. 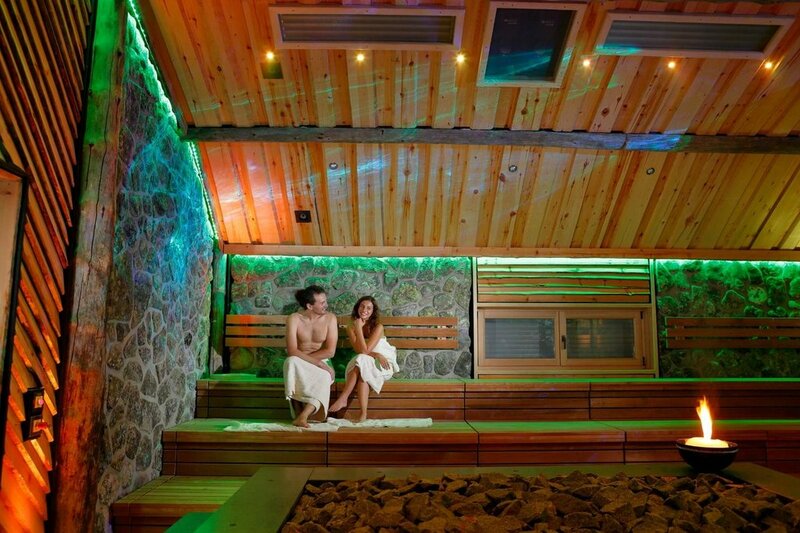 We offer our guests of the Sauna World an exclusive service. Our tent lounge as well as our feel-good lounge are special rest areas with 14 loungers, which can be booked for half a day from 10.00 am to 4 pm (Sat., Sun. and on holidays from 09.00 am to 4 pm) , from 4.30 pm to 11 pm or for the whole day. We offer mineral water and fruit for refreshment. This service costs 9.00 € for half a day and 14.00 € for an entire day. For bookings and information, please contact our reception desk at 05221 922-260. Pure relaxation: A quick guide to how to sauna. There is always a first time: Not everyone has already had the pleasure of going to the sauna let alone of visiting our beautiful Saunawelt. If you visit us for the first time, you are at the right place. 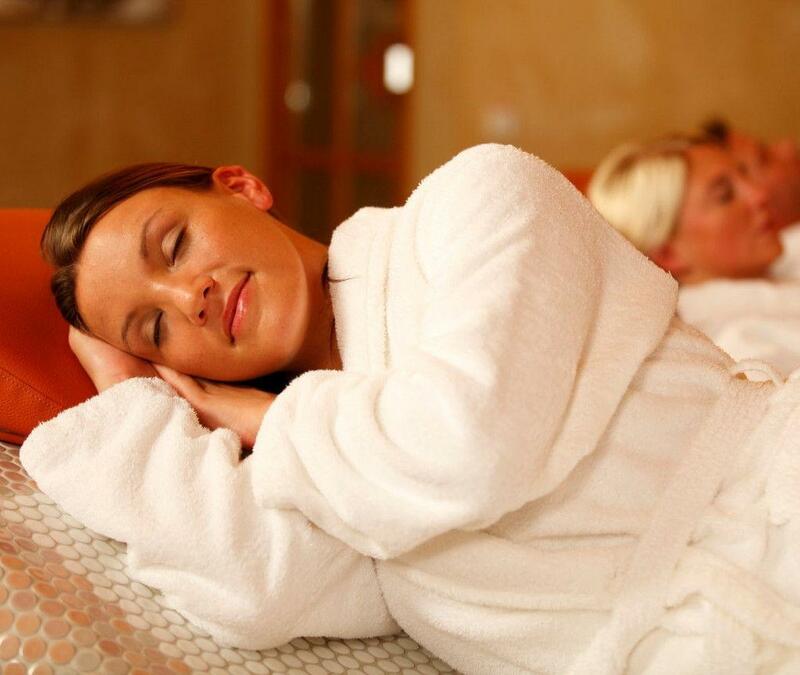 We have put together a short guide to make sure you can get the maximum relaxation out of your visit. Download the Guide as PDF. 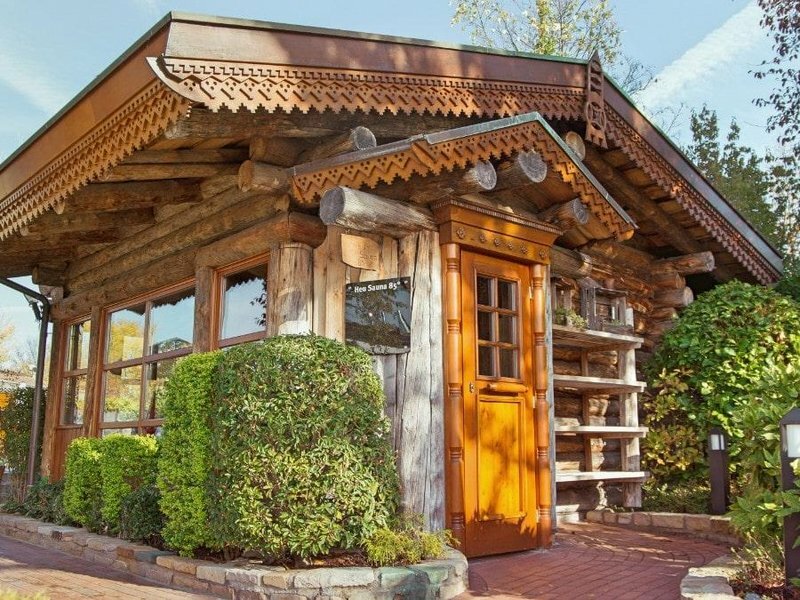 Freshly prepared and always delicious – that’s our range of sauna dining. We have fresh salads, cool drinks or little snacks for you to enjoy between sauna sessions. A wide choice is always available, from light to hearty food. In addition to our standard fare we have themed menus which change regularly. You can enjoy our food and drinks at various locations in the H2O sauna landscape. 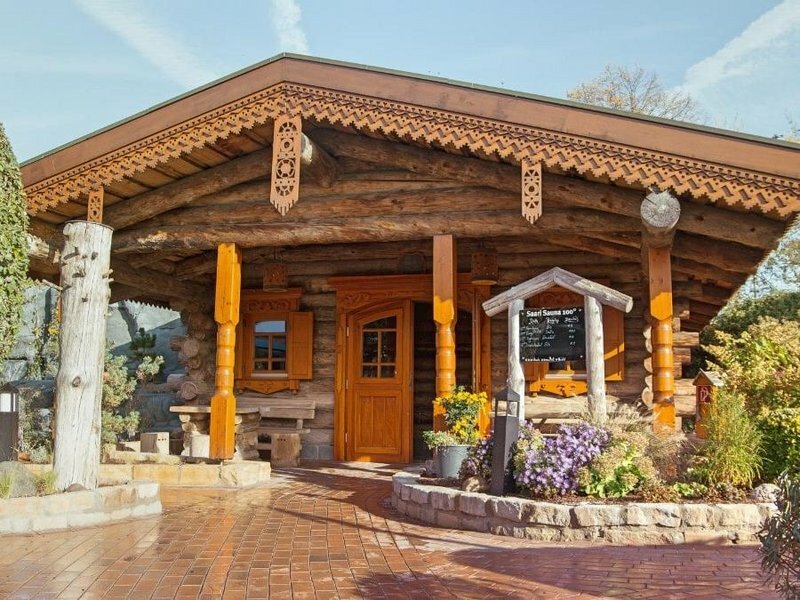 Indoors you will find the welcoming restaurant with seating areas and the living room which looks out on to the beautiful sauna garden. Download menu 'Felsentheke' as PDF file. Download menu as PDF file. The H2O Sauna World is an unique oasis of peace an well-being. An island of relaxation away from everyday hustle and bustle. 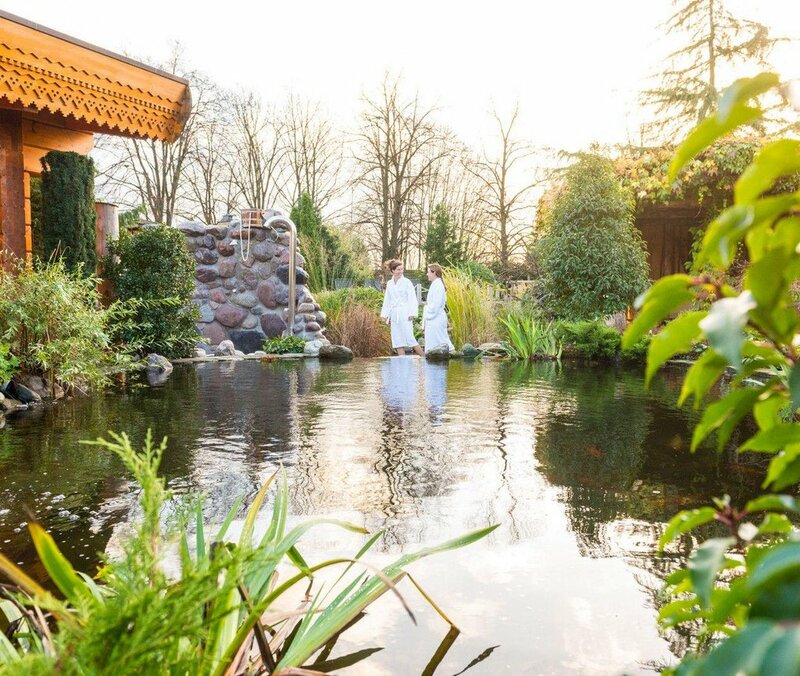 Find peace of mind, reconnect with yourself, balance your body and soul – enjoy the unique sauna landscape and our wonderful Nordic-style sauna garden.